At the heart of an effective website is smart, modern design allied to user-friendly functionality. Whether you need a brochure site or an e-commerce store we have the skills you need. 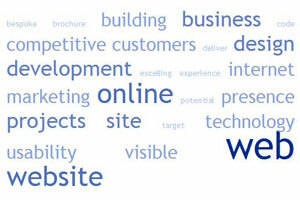 When we design and build a site we also take into account the requirements for SEO and visitor usability. Building great looking and effective websites is what we do. A well-designed website can make all the difference when it comes to your online business excelling or underperforming. Our experienced web designers can create fantastic looking websites that perfectly reflect your brand, speak directly to customers and function flawlessly for your visitors’ usability. Our web developers use the latest technologies and code only to the highest industry standards. And they will always be structured and coded with search engine optimisation in mind. Recent analysis shows that businesses who actively use the internet are growing 4 times faster than those that do not. Two thirds of people have purchased goods or services online. A third of people have accessed the internet via a mobile device (e.g. smart phone) and the use of these devices will dramatically increase in the next few years so driving overall internet usage even higher. So, regardless of whether your business already has a web site or not, you need to make sure that your internet presence is as compelling and competitive as possible. Once you have a great website you need to make sure it is visible to internet users by taking advantage of the full range of online marketing and media opportunities. Whether you need a brochure or micro-site or a full online retail solution, we approach all web design and web development projects with the same level of professionalism and consistency. From initial web design concepts to building and developing ecommerce databases or bespoke CMS platforms, we always deliver projects on time and at competitive rates. We have considerable knowledge and experience in both PHP and .net technology if this something you require. We cannot stress enough how important it is to consider how you will make your new website visible to potential customers. We can help you think through your online marketing activity and then help you implement it. Only this way can you properly capitalise on your investment in your web site development. In addition to web site design and technology we can also sort out any domain names, hosting and SSL certificates your web presence might require. Contact us to discuss your requirements. We can help you with the thinking phase and guide you in the direction of the most appropriate solutions.